Make sure you're registered to vote so your voice will be heard on Election Day on November 3rd. Why does NYLCVEF host forums and not debates? Let our senior vice president, Josh Klainberg, explain: There are a lot of debates that happen out there and as watchers of debates style trumps substance and you kind of lose what the issues are all about. 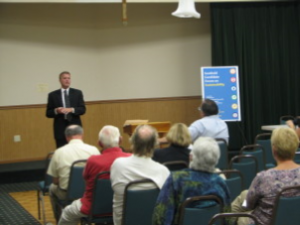 That's why the candidates for Southold Town Supervisor took turns answering questions from the audience and moderator last night at the Knights of Columbus Hall in Cutchogue -- so they could really get down to the issues. The candidates, incumbent Scott Russell and challenger Damon Rallis tackled complicated issues like wastewater treatment, water quality, and natural resource protection in front of the packed crowd. Our co-host for the evening was the North Fork Environmental Council and their president, Bill Toedter, moderated the discussion. "We think it's very important to compare apples to apples about what people are saying about these issues and for you to come away with your own conclusions," Toedter said when addressing the audience. Learn more about the event in the East End Beacon and make sure you're registered to vote so your voice will be heard on Election Day on November 3rd. Members of the East Hampton Environmental Coalition joined residents at the Amagansett Free Library last Saturday to hear from the candidates for Town Board about where they stand on the environment. The room was almost filled to capacity, clearly highlighting how important the environment is in this election. Democratic candidates Supervisor Larry Cantwell, Board Members Sylvia Overby and Peter Van Scoyoc and Republican Candidates Thomas Knobel, Margaret Turner, answered almost 20 questions about climate adaptation, septic and wastewater issues, aquifer protection, estuaries, clean energy, dark skies, and quiet skies. These forums allow the public to learn more about their elected officials and candidates running for office. Thank you to the EHEC who co-sponsored the event and the candidates for participating. Election Day is just around the corner, make sure to check our Citizen's Toolkit to learn about registering to vote so your voice will be heard this November. Last night, environmentalists in Schenectady packed the house to ask the candidates for mayor their position on a variety of environmental issues. Mayor Gary McCarthy and candidate Roger Hull touched on everything from recycling to biking to LED lighting at Proctors Theater. Thank you to our partner organizations the Sierra Club Hudson Mohawk Group, Mohawk Hudson Land Conservancy, Friends of the Woodlawn Preserve, and Environmental Clearinghouse of Schenectady. Voters in Schenectady will go to the polls to decide their next mayor on November 3rd. Register to vote in your town if you haven't already! Residents in the Hudson Valley's Congressional District 18 know there are a lot of environmental issues facing their communities. That's why it's important to know where the congressional candidates hoping to represent District 18 stand on environmental issues like clean energy and natural resource protection. 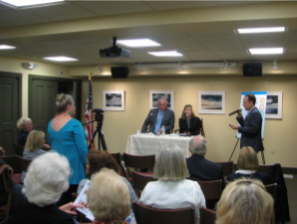 Candidates Nan Hayworth and U.S. Rep. Sean Patrick Maloney gave their opinions on these important issues and more on Tuesday, October 14th at Bedford Historical Society's Historical Hall (608 Old Post Road, Bedford). The event featured lively discussion from the packed house. You can watch the whole debate in the video above. The two spoke at a candidate forum sponsored by NYLCVEF -- marking the second occasion on which the two have come together for such an event to discussion environmental issues. The last time these candidates met for a similar NYLCVEF environmental forum was in October 2012. The two candidates laid out their sustainability records and took questions from the audience and a panel of environmental experts, including representatives from Scenic Hudson, Riverkeeper, the Daily Voice and the Pace Energy and Climate Center. Issues called into question included the expansion of the Algonquin Pipeline, the closing of Indian Point and government response to the impact of hurricanes Sandy and Irene. The two candidates’ stances differed on many of these issues. Maloney opposes the expansion of the pipeline, while Hayworth supports the expansion. Maloney favors the shutting down of Indian Point, and Hayworth believes that keeping the power plant open is the better alternative to the larger carbon footprint of a natural gas plant. You can read more and listen to excerpts from the forum in the Journal News, the Daily Voice and WAMC. As a nonprofit, nonpartisan and educational organization, the NYLCV Education Fund does not make endorsements in political races. Our goal with this forum was to educate Hudson Valley residents about environmental issues and elevate the public dialogue around sustainability. Thanks to all of our partner organizations, as well as our media partners at WAMC Radio and the Daily Voice for making the forum a success. Hundreds of Hudson Valley residents came out to SUNY New Paltz on October 1st to hear from the Congressional candidates in District 19. Both candidates - incumbent Chris Gibson and Sean Eldridge - spoke about the important environmental issues facing the region. This important forum, co-hosted by NYLCVEF and SUNY New Paltz Center for Research, Regional Engagement and Outreach, attracted voters from all over the area. Each candidate appeared separately, highlighting the environmental topics they found most important. U.S. Rep. Gibson and Sean Eldridge discussed a range of environmental concerns including climate change, clean water and energy. Congressman Gibson focused on farming in the region as well as local land conservation. Sean Eldridge also highlighted farming in the region and spoke about getting younger people interested and attracted to farming through incentives by the federal government. Other topics covered during the forum included major concerns like included transit-oriented development, renewable energy, hydrofracking and much more. The candidates took questions from a panel of environmental experts, including representatives from Scenic Hudson, Riverkeeper, and local reporter Allison Dunne from WAMC. The host of the forum was SUNY New Paltz's Dr. Gerald Benjamin. As a nonprofit, nonpartisan and educational organization, the NYLCV Education Fund does not make endorsements in political races. Our goal with this forum is to educate residents about environmental issues and elevate the public dialogue around sustainability. Special thanks to our media sponsor WAMC/ Northeast Public Radio as well as our partner organizations. The New York League of Conservation Voters Education Fund and the North Fork Environmental Council convened an opportunity for the Riverhead Town Supervisor candidates to discuss sustainability challenges facing the town on Tuesday night. Town Supervisor incumbent Sean Walter and challenger Angela DeVito were asked about some of Riverhead's most pressing environmental issues including surface and ground water quality, open space preservation and land management, dark skies enforcement and Enterprise Park at Calverton. The differing opinions between the two candidates were especially highlighted on the issue of the dark skies ordinance as they disagreed on whether the ordinance has been effectively enforced. 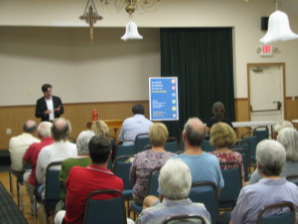 Despite the differences between the candidates, both Walter and DeVito made it clear that as Town Supervisor they will protect the land preserved in the creation of Enterprise Park at Calverton and agreed on the need to reinvest in sewage treatment plants and replace residential septic systems to protect water quality. A special thanks to all of our partners, the Community Planning Center Group for the East End, the Jamesport-South Jamesport Civic Association, the North Fork Environmental Council, the Peconic Baykeeper, Peconic Green Growth and the Sound Park Heights Civic Association in helping to coordinate such a great discussion. Staten Island Candidate Forum Was A Big Success! Staten Islanders turned out in force at the Jewish Community Center on October 16, 2013 to hear where candidates Steve Matteo and John Mancuso stand on the most pressing sustainability issues facing the 50th City Council District. This candidate forum was hosted by NYLCVEF along with Protectors of Pine Oak Woods, the Westerleigh Improvement Society, Grasmere Civic Association, Grant City Civic Association, the Natural Resources Protective Association and Feeding Families. The forum covered a wide range of issues, from the preservation of Mount Manresa to controlling Staten Island’s growing deer population. Both candidates stressed that their first environmental priority if elected will be Hurricane Sandy recovery and future resiliency. The candidates also agreed on the need to invest in infrastructure to protect the coastlines and the importance of improving transportation options in Staten Island to relieve the reliance on cars. You can read the Staten Island Advance’s coverage of the forum, which includes a clip of the candidates' perspectives on Mount Manresa preservation. Our thanks to the candidates and everyone who joined us for this event. And special shout-out to our partner organizations that helped to make this forum a success! Hundreds of Long Islanders turned out for an insightful discussion with the two candidates running for Nassau County Executive on Oct. 2, 2013 at Hofstra University. The Nassau County Executive Forum on Sustainability, co-hosted by NYLCVEF and Hofstra University, covered a wide range of sustainability concerns that the county currently faces, from investments in wastewater treatment to mass transit, clean energy and more. Expertly moderated by Larry Levy, the executive dean of National Center for Suburban Studies at Hofstra, the forum gave the floor to County Executive Ed Mangano and his challenger, former County Executive Tom Suozzi. Questions were asked by an expert panel that included Adrienne Esposito, Executive Director - Citizens Campaign for the Environment; Christopher Capece, Senior Development Director - Avalon Bay Communities, Inc.; Jennifer Rimmer, Director of Strategic Initiatives and Sustainability, Northeast Region - AECOM; and Lisa Dix, Senior New York Representative - Sierra Club, Beyond Coal Campaign. You can check out the full recording of the forum by clicking here. Newsday also had a write-up of the forum that noted both candidates said they would support the creation of an outfall pipe that extends into the Atlantic Ocean to get rid of the treated sewage water from the plant. Other topics covered at the forum included funding for the county bus system and the revitalization of downtown areas. Thanks to everyone who joined us for this great event. And thank you to our partnering organizations that helped make the forum a success: APA Long Island, Citizens Campaign for the Environment, Operation Splash, Tri-State Transportation Campaign and Vision Long Island.